Are Diet Pills Bad For You or Can They Actually Help? It is a common question and for good reason. Worldwide obesity numbers have reached a billion and climbing. In the US, the number of people who are on some type of diet is around 45 million with many of those stopping and starting new plans over and over throughout the year. The diet industry, which includes everything from weight loss programs, diet plans and supplements is booming, with around $33 billion dollars in sales. That leaves people thinking that perhaps there is something to this industry to be bringing in this much money and has many of them asking are diet pills bad for you? Let me assure you, there are no magic diet pills and few that give even a fraction of their promises. But, the question is are they bad and that can be answered with a resounding yes in most cases. They are bad not only for your health but your wallet. But please, let me explain. Most diet pills, whether they are promising fat burning, appetite control or muscle growth fall under the category of supplements which means they are largely unregulated. What they claim is the “active” ingredient in that bottle may not even be in there! And that is the problem, you never really know what you are getting, how much of it you are getting or where it came from. That also means that you don’t know how these ingredients will work (or not work, as the case may be). In April of 2013, the FDA banned supplements that were made with an ingredient called dimethylamylamine or DMAA because of reports of serious illnesses and more than a few deaths. That ingredient was typically included in products designed for weight loss and muscle building. Nearly a dozen companies were told via letter by the FDA to stop producing and promoting their products with this ingredient in them. By this time, the number of reports forwarded to the FDA was around 60. In the year before this move, the US military had removed DMAA containing supplements from all posts after the death of 2 soldiers were linked to a supplement that contained it. In October of 2013, the problems with DMAA were getting more serious with one supplement, known as OxyELITE Pro being linked to nearly thirty liver failure cases in Hawaii.One woman, a mother with five children, died. This is only one example. DMAA is only one possible ingredient for these supplements. Because there is no regulation there is no real standard. There is no safety or protections in place. Sure, you might lose a few pounds in the early days of taking a diet pill but at what cost? Are you really sure that you would rather be dead and skinny than fat and alive? Many people buy a diet pill to help them “get started” with losing weight and then intend to stop when they have managed to lose X number of pounds. The problem is that with most people the goal they have set is unrealistic and that X number of pounds just never seems to come off so they either increase their dose of the diet pill they started with or they try something advertised or promised as “stronger”. Before long, that person has become addicted to diet pills and it is a serious problem. For the record, the experts in addiction treatment separates the problem into two categories: diet pill abuse and diet pill addiction. If you are knowingly taking more than the suggested amount, doubling up on pills and other supplements or hiding your use of diet pills then you are possibly abusing them. If you do most or all of these things and feel that you cannot function without diet pills, you suffer from any of the many possible side effects but continue to take the pills anyway or your feelings are dependent on whether you have taken your pills for the day, you might be addicted. If you or anyone you know has said “yes” to any of these things, please seek help from a qualified professional. The process of eating and digesting food is a complex one. Metabolism is influenced by many things and controlled by specialized hormones in the body. Unfortunately, these hormones can get thrown off by anxiety and stress, not getting enough sleep or even too much of that delicious, delicious cake your mother brought over. Metabolic rates are also influenced by how much you weigh, how much of your weight is fat and how much exercise you get. Genetics plays a role in your metabolism and so does your age. Most diet pills work to reduce appetite plus to speed up the metabolism so that you burn fat faster. Those ingredients might work as they are supposed to for a brief period but eventually your body is going to get used to them and then there will be a problem. Problem A: is that your body will get used to the ingredients and will simply override them so they are no longer effective. For instance, supplements that contain large doses of caffeine might work for a week or two but eventually your body gets used to it and you no longer feel the effect. Problem B: is your body is used to the ingredients and defaults to them instead of the hormones. In either case, once you stop taking the pills your body will have to figure out what it is supposed to do on its own once again. This may mean a period of time where your metabolism is at its very slowest and unfortunately for many people that might mean some weight gain. Many people panic and will run right out to get a new supply of the diet pills and the whole cycle starts all over again. Lose weight while you are sleeping and wake up thinner! Lose weight without changing your diet and without strenuous exercise. Get fit without the cravings and without hunger. If you reduce the amount of food you are eating it is a no-brainer that you are going to be hungry. The rational person would just find something to occupy their mind until their body adjusted to the smaller amount of food but the diet industry does not want you to be rational at all. In fact, they want to keep you in a pill buying frenzy! Now, those ads are the work of marketing gurus and big companies and they are held to certain standards. However, there are some supplements and diet pills that slip through the cracks of those standards. Some supplements get pulled from the shelf because they are dangerous. Some get involved in class action lawsuits usually because of false advertising. You were supposed to shake Sensa on top of your food and it magically made you eat less and you magically lost weight. They had a “doctor” and “scientific studies” to back it up and everything. Except, it turns out that most of what they were saying was false and those studies were not so much independent as they were in-house, so to speak. Sensa’s makers ended up hit with a nine million dollar lawsuit; six million dollars of that was sent to consumers in the form of refund checks. Hydroxycut is currently settling its own lawsuit which again, dealt with false advertising with every single product in the line. (More than 20 products in all.) But, people still fall for these ads and why? Because they want to believe them so much that they suspend reason and rationality. They just want to believe! I hate to be the bearer of bad news but in most cases the only thing that will get any smaller is your wallet. The diet pill that is promising you a whole new body is not telling you the whole story and by the time you catch on, you are down by fifty bucks or more (if you are lucky) and in some cases much, much more. That is not to mention the companies that do not honor returns, the companies that double bill your credit cards or sign you up for automatic shipments that is discussed in the smallest of small print. By the time you get that all straightened out your are stressed out, in debt and have not lost a single pound. Does it sound worth it to you? 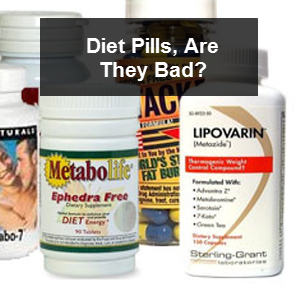 Back to the original question: are diet pills bad for you? Well, yes, yes they are. If you need to take something, take a good quality men’s multivitamin or women’s multivitamin and then learn a few things about proper nutrition. 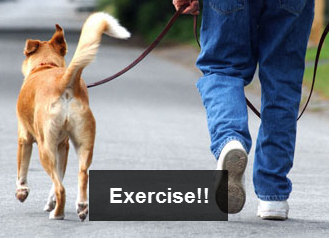 Get some exercise even if that means taking a walk around the block. If you want to buy something to help with weight loss go to the local dog shelter and rescue a pup – take him for walks a few times a day and you will shed pounds without dangerous chemicals and you make a new buddy in the process. It’s a win-win. There are also brilliant and “pill-less” diet programs out there like Truth About Abs, which are highly recommended and have very high success rates if you are looking to lose weight in a safe way. You can read my full review about this product here. Hello, Kyle. This is a great review of diet pills. I’m like you, I did try them in my younger, crazy days for energy. They worked, I stayed awake for 3 days, but when I can down it hit me hard and I was in the hospital. I don’t recommend any diet pill, because you really don’t know what you’re getting. Thanks for sharing! I think we all did at some point, I even tried ephidrine at one point that was a horrible idea…but yes it worked simply because it got your heart racing. Fake energy. If you want to lose weight it comes down to choices. Choosing the right foods, choosing not to eat when you are hungry, and choosing to go to the gym to work out instead of watching TV. A pill is just a false way of telling yourself you are making progress. It’s very disheartening to find out that these pills don’t work especially when you actually fall for the hype and part with your hard earned cash! The bottom line is that if you want to lose weight it’s 80% what you eat and 20% exercise. This is very true Alanna, the cycle will continue because by nature people are (a) lazy when it comes to dieting (b) would rather take a pill for pretty much any problem they have in life. Put these two things together and you have a thriving diet pill market. At the end of the day anyone that has lost weight knows that exercise is not the best way to do it. Eating less is. If you have ever tried to burn 500 calories it is not that easy, but driving by McDonalds and grabbing yourself a cup of (no sugar) coffee is simple. Mindset pays when it comes to losing weight.